Born in 1961, Alexander Sheversky grew up in Chisinau, Republic of Moldova, helping his father draw on walls, literally. His father was an artist who created many murals in their home and accepted commissions from Soviet officials, which lined their hallway with canvases. From the time he was 12-years-old until he was 16-years-old, Sheversky helped his father complete these paintings. At 16, he accepted a machinist position in his hometown but didn’t care for the work. He convinced his father that he wanted to be an artist and eventually studied at I.E. Repin Academy of Art. After graduation, he worked for a large department store with other artists who specialized in creating paintings and displays for the store. In 1986, Alexander began exhibiting his paintings in Chisinau and critical acceptance and recognition followed. Russian officials selected him to exhibit in the competitive environment in Moscow. His success led him to manage a studio for artists who accepted government commissions. He now lives in Vancouver Canada. Sheversky’s artistic style reflects his admiration for Rembrandt and Vermeer. His masterful chiaroscuro effects produce realism in his paintings that can be compared to past European masters. He carefully creates still lifes with a geometrical sense of order and then paints light in a three-dimensional form to produce dramatic effects in his works. 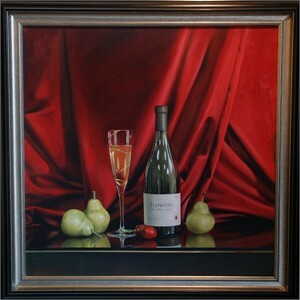 The light and shadow effects seen in his re-creation of draped material or closely nestled wine bottles showcase his painting skill and the influence of modern-day classicism. Lighting and strong colors are reasons why Sheversky chooses to paint with acrylic instead of oil. He explains, “Acrylic dries faster; therefore, I can apply more paint and create stronger colors. With oil, the artist must paint from dark to light. With acrylic, I can paint from light to dark and create more brightness in the painting.” A dry brushstroke over the entire painting creates visual smoothness across the canvas. During the course of 2010 Alexander was offered a series of outstanding opportunities to exhibit his art in two national museums: the National Arts Museum in Kishinev, Moldova (July, 2010) and the Odessa State Museum of Fine Arts in Odessa, Ukraine (Aug, 2010), each of which were curated by experts in their fields and shown to discerning audiences. His work has already been captured in a retrospective book "Alexander Sheversky. Contemporary Realism", published in 2007. Born in 1961, Alexander Sheversky grew up in Chisinau, Republic of Moldova, helping his father draw on walls, literally. His father was an artist who created many murals in their home and accepted commissions from Soviet officials, which lined their hallway with canvases. From the time he was 12-years-old until he was 16-years-old, Sheversky helped his father complete these paintings. At 16, he accepted a machinist position in his hometown but didn’t care for the work. He convinced his father that he wanted to be an artist and eventually studied at I.E. Repin Academy of Art. After graduation, he worked for a large department store with other artists who specialized in creating paintings and displays for the store. In 1986, Alexander began exhibiting his paintings in Chisinau and critical acceptance and recognition followed. Russian officials selected him to exhibit in the competitive environment in Moscow. His success led him to manage a studio for artists who accepted government commissions. He now lives in Vancouver Canada. Sheversky’s artistic style reflects his admiration for Rembrandt and Vermeer. His masterful chiaroscuro effects produce realism in his paintings that can be compared to past European masters. He carefully creates still lifes with a geometrical sense of order and then paints light in a three-dimensional form to produce dramatic effects in his works. The light and shadow effects seen in his re-creation of draped material or closely nestled wine bottles showcase his painting skill and the influence of modern-day classicism. Lighting and strong colors are reasons why Sheversky chooses to paint with acrylic instead of oil. He explains, “Acrylic dries faster; therefore, I can apply more paint and create stronger colors. With oil, the artist must paint from dark to light. With acrylic, I can paint from light to dark and create more brightness in the painting.” A dry brushstroke over the entire painting creates visual smoothness across the canvas. During the course of 2010 Alexander was offered a series of outstanding opportunities to exhibit his art in two national museums: the National Arts Museum in Kishinev, Moldova (July, 2010) and the Odessa State Museum of Fine Arts in Odessa, Ukraine (Aug, 2010), each of which were curated by experts in their fields and shown to discerning audiences. His work has already been captured in a retrospective book "Alexander Sheversky. 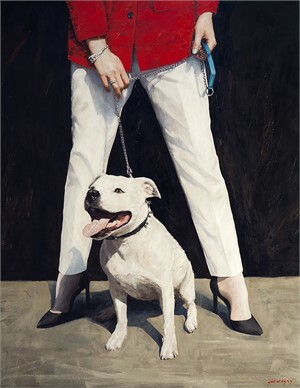 Contemporary Realism", published in 2007.